Extract from the Northern Times of August 1st 1918. 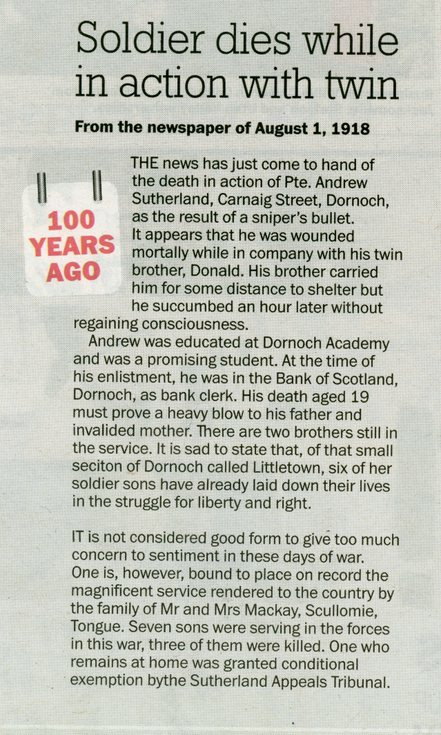 '100 years ago' With the heading 'Soldier dies while in action with twin. It relates to Andrew Sutherland of Carnaig Street. As a result of a snipers bullet he was mortally wounded at the age of 19. His brother Donald carried him to safety, but he succumbed an hour later. Andrew worked as a bank clerk at the Bank of Scotland, Dornoch.